Mirror-writing is the production of letters, words or sentences in reverse direction, so that they look normal when viewed in a mirror. Some people may mirror-write intentionally; but unintentional mirror-writing is surprisingly common amongst young children, and in brain-damaged adults. Unintentional mirror-writing suggests a tension between a tendency for our brains to treat mirror-images as equivalent, and a culturally imposed need to distinguish between them for written language. This article explores the various manifestations of mirror-writing, and the ideas put forward to account for it. Picture yourself in a taxi on a cold, rainy day, condensation on the windows. You want to write ‘bye-bye’ to your daughter waving at you from the house. In order to be read by her, you would need to write in reverse on the inside of the window, transforming your habitual writing actions to do so. This is ‘mirror-writing’ – reversed writing that looks normal when viewed in a mirror; like the sign on the front of an ambulance. Since Western scripts typically run from left to right, this reversed form is also known as levography (Critchley, 1928) or sinistrad writing (Streifler & Hofman, 1976). Mirror-writing is striking and mysterious. It has been practised deliberately by some notable individuals, most famously Leonardo da Vinci, and portrayed to powerful effect in literature and visual art (see Box, right). Mirror-writing is of special interest to psychologists because it can sometimes arise in people trying to write normally. For example, unusual writing demands can sometimes mislead us into writing backwards. If we write onto paper pressed against the underside of a table, or against our forehead (Critchley, 1928), we may fail to transform our actions to compensate for the altered plane of performance, and our writing may come out mirror-reversed. Mirror-writing is also common amongst children learning to write, and is noted in adults following brain damage, usually to the left hemisphere. But what do these phenomena tell us about our brains? Do we each harbour a latent looking-glass world, poised to usurp the everyday given the right conditions? Is mirror-writing after brain damage a recurrence of the childhood form, or different? More than a century of sporadic scientific literature, and some of our own recent observations, suggest answers to these tantalising questions. Does mirror-writing imply reversed perceptions, or is it only that the action comes out backward? This captures the dichotomy between perceptual and motor explanations of mirror-writing, from the classical literature to the present day. On the perceptual side, Orton (1928) suggested that, for every word or object we recognise, an engram is stored in the dominant (left) hemisphere, and its mirror-image in the non-dominant hemisphere. Mirrored-forms emerge in children, due to incompletely established hemispheric dominance, but are suppressed in adults unless released by left-hemisphere damage. Subsequent perceptual accounts, such as the spatial disorientation hypothesis (Heilman et al., 1980), share the core idea that mirror-writing is one aspect of a more general mirror-confusion. Perceptual explanations predict that mirror-writing should be associated with perceptual confusion, and even with fluent reading of reversed text. And if the mirroring arises at a perceptual level, then mirror-writing should emerge regardless of which hand is used. On the motor side are those who argue that action representations are critical to mirror-writing (e.g. Chan & Ross, 1988; Erlenmeyer, 1879, cited in Critchley, 1928). The basic insight is that learned actions are represented in a body-relative scheme, not in external spatial coordinates. Thus, for a right-handed Westerner, the habitual writing direction is not left-to-right per se, but abductively outwards from the body midline. If executed by the unaccustomed left hand, this abductive action will flow right-to-left, unless it is transformed into an adductive inward action, much as we need to transform our action when writing on a window for a reader on the other side. On this view, children might mirror-write with either hand if they have yet to learn a consistent direction, but literate adults should do so only when attempting to write with the left hand whilst cognitively impaired or distracted, so that the required transformation is omitted. Since perceptual factors play no explanatory role, motor accounts predict that mirror-writing should not entail perceptual confusions or mirror-reading. Of course, perceptual and motor accounts need not be mutually exclusive: the manifestations of mirror-writing may be too various for any unitary account (Critchley, 1928; but see Della Sala & Cubelli, 2007). As we shall see, the facts favour a motor interpretation in most cases; but there are possible exceptions, and interesting nuances to the story, as well as some unresolved puzzles. As any nursery or primary teacher knows, mirror-writing is very common amongst children learning to write. These productions are not mere confusions of legal mirror-image characters (such as ‘b’ and ‘d’) but can involve the reversal of any character, and even whole words and phrases. A child may sign her name neatly but back-to-front. Interestingly, some characters are more likely to be reversed than others, particularly those such as ‘3’ or ‘J’ in which the correct form ‘faces’ leftwards. This suggests that during exposure to written language, the child implicitly extracts the statistical regularity that most characters ‘face’ to the right, then over-applies this ‘right-writing rule’ (Fischer, 2011). Several myths surrounding mirror-writing in children should be dispelled. Most prominent is the traditionally assumed association with slow intellectual development, arising from early anecdotal literature (e.g. Orton, 1928) and studies of ‘mentally defective’ children (Gordon, 1920), and propounded as a visual motif through popular works (e.g. Winnie-the-Pooh, the Far Side cartoons). Recent studies have converged in showing that the likelihood of mirror writing does not correlate with intellectual abilities. Cubelli and Della Sala (2009), for instance, reported no significant difference in intelligence between mirror-writing and non-mirror-writing children of the same age (cf. Fischer & Tazouti, 2011). There is similarly little truth in the idea that mirror-writing is more common in left-handers. Mirror-writing in childhood does of course correlate with age, but the true underlying factor here is the stage of acquisition of writing, with occasional mirror-writing as an intermediate stage between no writing and correct writing (Della Sala & Cubelli, 2009; Fischer & Tazouti, 2011). Situational factors further modulate the likelihood of mirror-writing at any given moment. For instance, children show sequential biases, tending to face each character in the same direction as the preceding one. An example from Fischer (2011) concerns the character pair ‘C3’, as written by 300 five-to-six-year old children: the probability of mirror-writing the ‘3’ was far greater (0.73 vs. 0.10) if the ‘C’ had been correctly written (i.e. right-facing) than if it had been mirror-written (i.e. left-facing). Spatial constraints are also important, and children as old as seven may write their name backwards if required to start from a point on the page that leaves inadequate space to write it forwards (Cornell, 1985; Fischer & Tazouti, 2011). That a simple spatial restriction can elicit mirrored script suggests a dominant role for motor factors, rather than perceptual confusion. Consistent with this, Della Sala and Cubelli (2009) found that the frequency of mirror-writing was no higher amongst children who had difficulty discriminating mirror images than amongst those who did not. Uncertainty about how letters should look does not seem to drive mirror-writing in children. Rather, childhood mirror-writing may tell us something about how writing actions develop. Specifically, it implies that the general shape of a letter is learned more rapidly than the direction for writing it. The key to understanding this may be to regard mirror-writing not as intrinsically errorful, but as a feat of action generalisation. It is a neat trick for a child to produce a perfect mirrored-form, which they have never been taught, as readily as the correct form that they have been shown repeatedly. For most actions, this mirror-generalisation would be useful, because anything that we do one way may need to be done in reverse at another time; we do not learn separately to turn a tap clockwise and anticlockwise, only to turn the tap. Writing, however, belongs to an unusual, evolutionarily recent, class of actions that have a culturally set directionality, and for which this generalisation is unhelpful. Acquiring the correct direction for writing in one’s culture may be a matter of stamping out the unwanted alternative after having learned the general shape of the action. Children grow out of mirror writing, but in some adults it makes an unexpected return. Mirror-writing is quite common following stroke, though usually transient. Frequency estimates vary from 2.5 per cent (Gottfried et al., 2003) to 13 per cent (Tashiro et al., 1987), but are much higher (24 per cent) if only left hemisphere lesions are considered (Wang, 1992). A review of single cases confirmed that mirror-writing following stroke is overwhelmingly associated with damage to the left hemisphere (93 per cent) and with use of the non-dominant left hand (97 per cent) (Balfour et al., 2007). The prototypical adult mirror-writer is a right-hander who loses right-arm motor function following left-hemisphere stroke, being forced to write with the left hand. Given this profile, could the strong association of mirror-writing with left-hemisphere damage be an artefact of forced left-hand use? Would mirror-writing be elicited in other groups simply by requesting writing with the left hand? When this tactic was tried, it yielded mirror-writing rates that did not differ statistically between right- and left-hemisphere damaged people (14 per cent of 36 cases vs. 20 per cent of 50 cases) (Balfour et al., 2007). Even amongst 86 healthy controls, writing with the left hand produced at least some reversals in 7 per cent of people; but writing with the right hand never did. These results fit the motor hypothesis, according to which involuntary mirror-writing in adults reflects left-handed execution of a right-hand action, without motor transformation. The transformation requires cognitive resources, so would be susceptible to attentional lapses, and especially vulnerable after brain damage. We must stress that the sporadic reversals obtained by asking brain-damaged people to write with the left hand are of a different order of severity from florid clinical cases, which may involve consistent reversal of words, multi-digit numbers and sentences (see Della Sala & Cubelli, 2007). To fully account for severe and persistent mirror-writing may require more pervasive cognitive insufficiencies, perhaps combined with anosognosia (lack of insight) or anosodiaphoria (lack of concern) (e.g. Angelillo et al., 2010). So, children may mirror-write because they are unsure of the correct direction, whilst adults retain the correct (abductive) direction, but fail to modify this motor habit for the unaccustomed hand. However, an alternative motor account, which relates involuntary mirror-writing more closely to the childhood form, has been advanced by Della Sala and Cubelli (2007). This ‘directional apraxia’ hypothesis proposes that involuntary mirror-writing reflects loss of knowledge of the direction of learned actions, with execution instead governed by a preference for abductive movements. This implies that the direction of an action is not only acquired later than its shape, but represented separately, and vulnerable separately to damage. It is not clear whether this account improves on the standard motor account in explaining documented cases of mirror-writing, but further data on the influence of language and handedness may prove decisive. Directional apraxia predicts that mirror-writing should affect the left hand for rightward scripts such as English, but the right hand for leftward scripts such as Hebrew or Arabic, regardless of the writer’s handedness. There is one report, which fits this prediction exactly, of a man who mirror-wrote in Hebrew but not in French with his right hand, yet produced the opposite pattern – mirror writing in French but not in Hebrew – with his left hand. However, the observation is anecdotal (Marinesco, cited by Russell, 1900), and requires replication. Mirror-writing does not entail an advantage for reading mirrored text; a fact that considerably bolsters a motor account (Critchley, 1928). But analogous phenomena can affect perception. Parietal lobe damage can induce an inability to tell apart mirror-images, even though subtle changes in shape or rotation are spotted (Davidoff & Warrington, 2001; Turnbull & McCarthy, 1996). Such mirror-confusions sometimes co-occur with mirror-writing (Durwen & Linke, 1988; Heilman et al., 1980; Wade & Hart, 1991). In other cases, perception may be systematically reversed, yielding fluent mirror-reading (Gottfried et al., 2003; Lambon-Ralph et al., 1997; Pflugshaupt et al., 2007). If these people also mirror-write, it may be deliberate, and some state that they do so in order to be able to read what they write. However, the most unusual report is of a polyglot woman who, following a concussion, mirror-read and wrote her first language, Hebrew (a right–left script), but not Polish or German (left–right scripts) (Streifler & Hofman, 1976). Her mirror-writing was apparently involuntary, affecting the dominant right hand (the left hand was not tested); and she displayed a range of other reversals, perceptual and conceptual (confusion of opposites like inside/outside, above/beneath). The language-specificity of her mirror-reversals is challenging to explain, but the tight parallel between her reading and writing suggests that involuntary mirror-writing can have a perceptual (or conceptual) basis in some cases. Like mirror-writing, acquired mirror-reading recalls the errors of childhood; and, as for writing, perceptual confusions in children may reflect a broadly advantageous mirror-generalisation. In nature, mirror-images are invariably two instances or views of the same thing, so it is efficient to represent them as equivalent. On the other hand, we sometimes need to distinguish mirror-forms, and nowhere is this more vital than in decoding written language. Functional neuroimaging suggests that a region of the left midfusiform gyrus (the ‘visual word form area’) may be critical to mirror-discrimination in reading (Dehaene et al., 2010; Pegado et al., 2011). The development of this capacity presumably suppresses mirror-reading errors during learning. Writing in Brain in 1896, F.J. Allen, a neurologically healthy Professor of Physiology, recorded his subjective experience of fluent left-handed mirror-writing, speculating that the ability may not be rare, just rarely practised. He proposed that ‘mirror-writing is often a symptom of nerve disease; but the disease need not be the cause of the existence of the faculty, but only the cause of its discovery’ (p.385). As already noted, mirror-writing is adopted deliberately by some brain-damaged people with reversed perceptions. It is also cultivated by some healthy, albeit unusual, people; often to a high level of skill. Celebrated practitioners include Lewis Carroll, who experimented with spatial as well as logical inversions, and was a skilled mirror-writer. Amongst the 100,000 letters that he wrote were a series of ‘looking glass letters, designed to be read in a mirror. Mirror-writing also appears in his stories and poems. In Through the Looking-Glass one of Alice’s first discoveries is a book printed in mirror-script. There was also Leonardo da Vinci, who wrote thousands of pages of his notebooks in mirrored script, with his left hand. Could deliberate mirror-writing offer insight into the nature of involuntary mirror-writing in brain-damaged adults? We have recently had the chance to address this issue with Kasimir Bordihn (KB), a German artist, who has practised various forms of mirror-writing for more than 50 years. KB is a natural left-hander, schooled to write with the right hand, who ‘discovered’ mirror-writing aged nine, finding that he could halve his time writing lines by writing forward with his right hand and simultaneously backward with his left. He later practised and extended this technique, writing forward or backward with either hand, including vertical as well as horizontal flips, and incorporating these into a distinctive ‘mirror-art’ (see cover). We have begun a case study of KB’s abilities, which is providing clear support for the motor hypothesis of mirror-writing, and some less expected results. First, whilst KB writes skilfully in a number of different directions, his most fluent form, and the only non-standard form that closely resembles his normal forward right-handed script, is horizontal mirror-writing produced with his left hand. This special status is consistent with the view that left-handed mirror-writing reflects the untransformed execution of a learned right-hand action. Second, when writing with both hands, his performance is far better if his hands move mirror-symmetrically to produce opposite scripts, than if they move in tandem to produce similar scripts. It is the motor and not the perceptual congruence that counts. Third, as with most involuntary mirror-writers, KB’s versatility with a pen confers no perceptual benefit: he is as baffled by mirrored text as any other reader. These characteristics match a motor account of mirror-writing. As well as asking KB to read mirrored text out loud, we assessed his recognition of reflected letters by psychophysical means, finding nothing unusual. But when instead we asked KB to discriminate pictures of left and right hands, he showed a consistent inability, performing dramatically worse than matched controls, and on one occasion faring no better than chance. This was not a general problem with body parts, as he could discriminate the laterality of feet very well; and it was not due to rushed decision making, as his hand discriminations were both slow and inaccurate. Rather, KB revealed a specific impairment for the discrimination of left and right hands. This body-part identification task is used widely as a test of motor imagery. People solve this task by mentally rotating their own hands or feet to confirm a match to the viewed picture (Parsons, 1987, 1994). One possible interpretation of KB’s result is that his unusual facility for (and/or history of) executing right-hand actions with the left may entail an abnormal degree of overlap in the neural motor representations of the hands. He may thus rotate his hands mentally to match the picture, yet fail to identify introspectively which hand has made the match. This is a highly preliminary suggestion, but the observation is certainly intriguing. One more flippant implication might be that Leonardo da Vinci, for all of his genius, may have had more trouble than the average Renaissance man in telling his left hand from his right. As children, we make mirror-errors in reading and writing. These perceptual and motor confusions are not tightly linked, but arise from parallel strategies of mirror-generalisation in perception and action. If we then learn to write with our right hand, mirror-writing may be the latent natural script of our left, and vice-versa, requiring only certain circumstances to emerge. Mirror-writing in its various forms – spontaneous, involuntary and deliberate – has long fascinated observers in art and science. Beyond its obvious curiosity value, it provides compelling insights into how we learn about, and represent the world and our actions within it. The story is intriguing, yet incomplete. We think there will be more to learn about ourselves in this particular looking-glass. 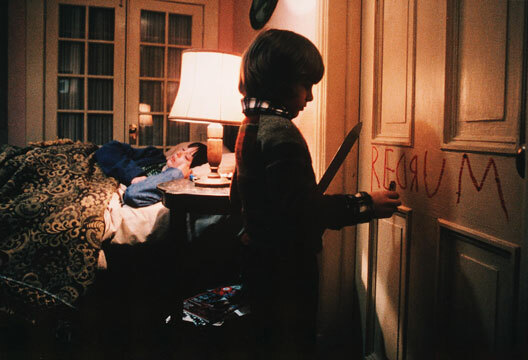 in Christopher Nolan’s Memento, the ‘facts’ are tattooed on Leonard's chest in mirror-writing so that he can read their reflection; in Stanley Kubrik’s The Shining, Danny writes REDRUM on the door, which is MURDER backwards (Maggie does the same with her toy blocks in the Simpsons episode Reality Bites). Mirror-writing also features in the Simpsons episode ‘Brother from the same planet’; the Scooby-Doo episode ‘Mystery mask mix-up’; The 25th Hour; Alvin and the Chipmunks; and Flowers for Algernon. For further examples, see Della Sala and Cubelli (2009). Allen, F.J. (1896). Mirror-writing. Brain, 19, 385–387.Angelillo, V.G., De Lucia, N., Trojano, L., & Grossi, D. (2010). Persistent left unilateral mirror writing. Brain and Language, 114, 157–163. Balfour, S., Borthwick, S., Cubelli, R. & Della Sala, S. (2007). Mirror writing and reversing single letters in stroke patients and normal elderly. Journal of Neurology, 254, 436–441. Chan, J.L. & Ross, E. (1988). Left-handed mirror writing following right anterior cerebral artery infarction. Neurology, 38, 59–63. Cornell, J.M. (1985). Spontaneous mirror-writing in children. Canadian Journal of Psychology, 39, 174–179. Critchley, M. (1928). Mirror-writing. London: Kegan Paul, Trench, Trubner & Co.
Cubelli, R. & Della Sala, S. (2009). Mirror writing in pre-school children. Cognitive Processing, 10, 101–104. Davidoff, J. & Warrington, E.K. (2001). A particular difficulty in discriminating between mirror images. Neuropsychologia, 39, 1022–1036. Dehaene, S., Nakamura, K., Jobert, A. et al. (2010). Why do children make mirror errors in reading? Neuroimage, 49, 1837–1848. Della Sala, S. & Cubelli, R. (2007). ‘Directional apraxia’: A unitary account of mirror writing following brain injury or as found in normal young children. Journal of Neuropsychology, 1, 3–26. Della Sala, S., & Cubelli, R. (2009). Writing about mirror writing. Cortex, 45, 791–792. Durwen, H.F. & Linke, D.B. (1988). Temporary mirror writing and mirror reading as disinhibition phenomena? A case study. Neuropsychologia, 26, 483–490. Fischer, J-P. (2011). Mirror writing of digits and (capital) letters in the typically developing child. Cortex, 47, 759–762. Gordon, H. (1920). Left-handedness and mirror-writing especially among defective children. Brain, 43, 313–368. Gottfried, J.A., Sancar, F. & Chatterjee, A. (2003). Acquired mirror writing and reading: Evidence for reflected graphemic representations. Neuropsychologia, 41, 96–107. Heilman, K.M., Howell, G., Valenstein, E. & Rothi, L. (1980). Mirror-reading and writing in association with right-left spatial disorientation. Journal of Neurology, Neurosurgery and Psychiatry, 43, 774–780. Lambon-Ralph, M., Jarvis, C. & Ellis, A. (1997). Life in a mirrored world: Report of a case showing mirror reversal in reading and writing and for non-verbal materials. Neurocase, 3, 249–258. Orton, S.T. (1928). Specific reading disability – strephosymbolia. Journal of the American Medical Association, 90, 1095–1099. Parsons, L.M. (1987). Imagined spatial transformations of one’s hands and feet. Cognitive Psychology, 19, 178–241. Parsons, L.M. (1994). Temporal and kinematic properties of motor behavior reflected in mentally simulated action. Journal of Experimental Psychology: Human Perception and Performance, 20, 241–245. Pegado, F., Nakamura, K., Cohen, L. & Dehaene, S. (2011). Breaking the symmetry: Mirror discrimination for single letters but not for pictures in the Visual Word Form Area. Neuroimage, 55, 742–749. Pflugshaupt, T., Nyffeler, T., von Wartburg, R. et al (2007). When left becomes right and vice versa: Mirrored vision after cerebral hypoxia. Neuropsychologia, 45, 2078–2091. Russell, J.W. (1900). A case of mirror writing. Birmingham Medical Review, 68, 95–100. Streifler, M. & Hofman, S. (1976). Sinistrad mirror writing and reading after brain concussion in a bi-systemic (oriento-occidental) polyglot. Cortex, 12, 356–364. Tashiro, K., Matsumoto, A., Hamada, T. & Moriwaka, F. (1987). The aetiology of mirror writing: A new hypothesis. Journal of Neurology, Neurosurgery and Psychiatry, 50, 1572–1578. Turnbull, O.H. & McCarthy, R.A. (1996). Failure to discriminate between mirror-image objects: A case of viewpoint-independent object recognition? Neurocase, 2, 63–72. Wade, J., & Hart, R. (1991). Mirror phenomena in language and non-verbal activities: A case report. Journal of Clinical and Experimental Neuropsychology, 13, 299–308. Wang, X-de (1992). Mirror writing of Chinese characters in children and neurological patients. Chinese Medical Journal, 105, 306–311.